It all starts with a template that we make from scratch. This is an enhanced image of our California fake id template showing the third image box. Of course, it is not visible unless it is under black light. We also show the perforated state bear which is only visible by shining concentrated light through the back of the id card. From the tactile DOB over the large image to the laser engraved signature on the front and DOB on the back, every detail is replicated flawlessly. 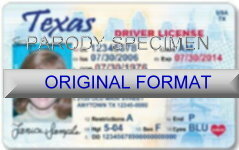 For your fake id, we use the image and information you supply on the order form. Background and size does not matter, as you can see, it will be edited. To make you the best fake id, the image you supply is extremely important. Please take the time to read our faq.htmlQuestions page to learn more about taking a good photo for your id. The finished card is perfection that will pass any bar or night club scrutiny, and every id we make will pass in-state inspection. We treat every customer order as if we are making the fake id for our best friend.